David Enloe and drummer Terry Anderson were both born on Christmas Day 1956 in Southern Pines. They met over music, playing recorders in a fourth-grade class at Raleigh's Powell Elementary. By high school, Enloe and Anderson were putting bands together. By the late '70s, they had hooked up with Jack Cornell to form the core of the Fabulous Knobs -- one of the most dynamic bands in the Triangle, thanks to lead singer Debra DeMilo. Numerous younger musicians in town found Enloe and the Knobs inspirational. After the Knobs dissolved in 1984, Enloe, Anderson and Cornell stayed together as the Woodpeckers with Dan Baird from Georgia Satellites. Then Baird left to rejoin the Satellites, so they continued on as the Woods. The Satellites had a hit single with a cover of the Anderson-penned Woodpeckers song "Battleship Chains" in 1987, the same year the Woods released their one album, "It's Like This." 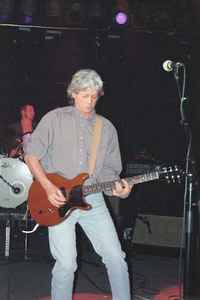 David Enloe, guitarist for the seminal Triangle bands Fabulous Knobs and The Woods, died early today after a long hospitalization. The cause of death was complications from hepatitis C. He was 50 years old.